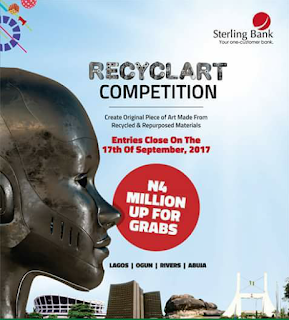 Sterling Bank Nigeria in partnership with the British Council, Da’ar Communications Plc and Mega Lectrics Limited is calling for entries for Recyclart competition, 2017. The purpose of the competition is to encourage Nigerians to explore positive ways to change their relationship with the environment, while expressing creativity and artistic talents using recyclable materials. It also serves as a means to preserve culture by empowering young artists and emerging talents nationwide to participate, create an original piece of art made from recycled and repurposed materials to be exhibited at a public space. 4 Grand Winners with repurposed structures representing one of the four (4) locations – Lagos, Ogun, Rivers, and Abuja will be rewarded in the competition. All four (4) Grand Prize Winners will receive a million naira (N1,000,000) each and a chance for a solo exhibition in one Sterling Bank public community park, roundabout or space in one of the four Sterling Bank zonal locations- Lagos, Ogun, Rivers, Abuja. The target audience for this competition are artists above 18 years of age. However, the competition is nationwide. Entries can be submitted from any state in Nigeria. But the art piece should represent one of the four states – Lagos, Ogun, Rivers or Abuja. Entries can be entered as a group. However, all individuals in the group must meet the contest qualification requirements. All material used on the design must consist of recycled or waste items. Artists must consider that all intended materials are durable for outdoor installation and can withstand the elements when scaled up. Miniature design should be approximately 38 x 38cm and must scale up without losing original 3D shape. Repurposed scraps and or objects made from iron, wood, metal, glass. Log on to www.sterlingbankng.com/recyclart and fill out the bio application form to get a reference number/code. Using the reference code, email a 300-word written description of your intended artwork, stating the method of execution and waste materials to be used. Also include a sketch and send to recyclart@sterlingbankng.com. The documents must be sent in pdf format. Entry closes on September 17, 2017. An internationally celebrated Nigerian sculptor, muralist, furniture designer, and multi-media artist. Founder of House of Deola is the leading lady of Africa haute couture fashion from Ondo state in Nigeria.